“New Orleans wasn’t ready for Indian gumbo,” said Mr. Vilkhu’s son, Ashwin, the restaurant’s general manager. “It is now.” This is an extraordinary time for the city’s signature dish. Gumbo, long a fixture in restaurants here, has disappeared from many menus as new chefs arrive with different cuisines and ideas, catering to a population remade by the transplants who settled in the city after Hurricane Katrina’s devastation in 2005. But the chefs who have stuck by the dish are using the moment to stretch its boundaries by adding ingredients that defy tradition, bringing it fresh relevance. Many of the innovations reflect global influences on New Orleans cooking, particularly from South and Southeast Asia. This time of year, with the cooler weather and the start of the Mardi Gras season, may be the best time to sample them — and to appreciate gumbo’s long and continuing evolution. Michael Gulotta, a New Orleans native, has resumed cooking the seasonal seafood gumbo he introduced as a lunch special last year at Maypop, his modern restaurant in the Warehouse district. It’s seasoned with lime leaf, fermented black beans and black cardamom, in homage to the Vietnamese and Chinese restaurants that have long flourished on the city’s outskirts. Gumbo has existed in various forms across south Louisiana for centuries. It can contain any number of ingredients, depending on the chef and the season. But until recently it was rare to find gumbo that incorporated ingredients beyond a fixed list of proteins (fowl, sausage, local shellfish), aromatics (onion, bell pepper, celery — known locally as the holy trinity) and spices (cayenne, thyme, white pepper). Gumbo’s flavor is further influenced by roux, the blend of fat and flour used to thicken the broth. It’s a French technique adopted by Louisianians, who often cook the roux so long that it darkens and takes on bitter notes reminiscent of Mexican mole. Sliced okra and the sassafras powder known as filé, a Native American contribution to Louisiana cooking, are also used as gumbo thickeners, either in combination or in place of roux. Boxers, briefs, brassieres and bikinis saw the light of day Sunday (Aug. 5) during the National Underwear Day parade that promenaded around Bayou St. John in Mid-City from Toulouse Street to Esplanade Avenue and back. The indiscreet procession was organized by Ryan Ballard, the founder of the Intergalactic Krewe of Chewbacchus Mardi Gras parading group, which may explain the Star Wars Stormtroopers who strode amidst the Victoria’s Secret shoppers Sunday. Underwear Day is a celebration cooked up by the underwear industry 15 years ago to lend its little-seen products some extra exposure. But Ballard said, from his point of view, the New Orleans Underwear Day parade is merely meant to present the public with a splash of fleshy fun in the heat of August. Plus, paraders donated fresh packs of underwear to the homeless. Ballard’s first National Underwear parade in 2016 took place in the Bywater. Back then, Ballard hoped to set a Guinness World Record for the largest gathering of underwear wearers, but he was foiled by the fact that so many paraders added costume accoutrement to their skivvies that the Guinness judges disqualified the event. Such is the nature of parading in the Crescent City, of course, where costuming just comes naturally. Having learned his lesson, Ballard did not attempt to break any records in 2018. 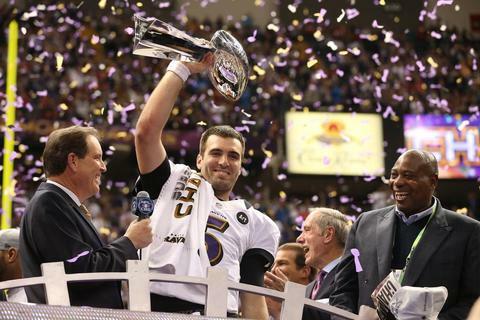 In one of the strangest Super Bowls in memory, the Ravens dominated the first half, were badly outplayed in the second half, and yet managed to survive for a win, the second championship in franchise history. Everything was going Baltimore’s way when a power outage delayed the game for 35 minutes, leaving players, fans and the news media confused. When play resumed, the 49ers seemed like an entirely different team and pushed the Ravens to the brink of a collapse. But Joe Flacco and the Ravens’ offense settled down and maintained control. Coach John Harbaugh of the Ravens proved to be a brilliant strategist, with an intentional safety on the team’s final possession all but guaranteeing the team’s victory. He made bold calls all game, making his younger brother Jim seem meek by comparison. The 49ers’ rookie quarterback Colin Kaepernick lived up to his hype after a bad first half. Flacco was the game’s most valuable player, and deservedly so, but Kaepernick cemented his status as one of the game’s rising stars. For Ray Lewis, the victory meant he got to go out on top. The linebacker has insisted he will not return regardless of the result, and if this was his last game, he went out a winner, even if it was in more of a supporting role than he may have imagined. The tendency among Super Bowl champions is for everyone on the team to suddenly believe they are worth a great deal more money. For Baltimore, already over the salary cap for next season before resigning Flacco, that could be a problem. But that is a problem for tomorrow. In a wild season, the Ravens defied all expectations and won a Super Bowl despite being the underdog in nearly every playoff game they played. A truly remarkable run.